You might have had a relaxing day at the beach-peaceful, tranquil, calming-but Phi Phi Island's Nightlife will definitely pick up the pace. The choice is yours. You can easily chill out in your room watching satellite TV and looking at the stars from your bungalow's private balcony. Or you can catch up on that book you wanted to read. However, there is a nightlife culture happening that you should know about. For a small island, nightlife in Phi Phi Island is lively. You can enjoy the fireworks on the beach, take in Thai Kick Boxing at the Reggae Bar, and enjoy cabaret nights-and that doesn't include the bars that you can hang out at and dance at. The bars feature all genres of music. From reggae and ambient soul to hip hop and dance music, you can enjoy a cocktail and dancing to your music of choice. Here also is an opportunity to meet other people from all over the world. It's a true cultural exchange and a multi-cultural experience during nightlife in Phi Phi Island. It's a melting pot of cultures while the natives are warm and friendly. The largest center for nightlife in Phi Phi Island is The Reggae Bar Complex. This center for nightlife in Phi Phi Island is the hottest night spot. It is outside, open-air, with five bars and a few pool tables. It is the perfect place to mingle and take in the good vibes. You may feel like you are in the Caribbean in this happening bar with the beaches and water surrounding you. Dance, groove, and enjoy the delicious drinks served at the bar. Or put down your coin, and play a round of pool. The nightlife in Phi Phi Island features an international crowd, so take the initiative and talk to your neighbour at the bar. You may discover new places to snorkel, new beaches that you did not know about, or he or she might have a great story to tell about his or her experience on Phi Phi Island. Yes, nightlife on Phi Phi Island can be exciting, fun and enlightening. Close by is another big night venue. The Dojo Bar always gets the street moving with some excellent early evening sounds. They also help with organizing the regular Phi Phi Party Crew, a boat trip with a party difference. Another international slice of life during nightlife in Phi Phi Island, is at Carlito's. Carlito's is the hang out for Swedish tourists. Maybe you'll hear the melodic Abba blaring out of the speakers here. 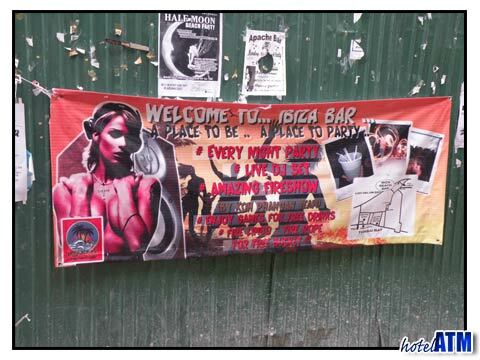 In any case, you will be guaranteed good music coming from Carlito's, a major bar in the nightlife in Phi Phi Island. Sink your feet in the sand, and gaze at the stars while you drink your ice-cold beer or cocktail. 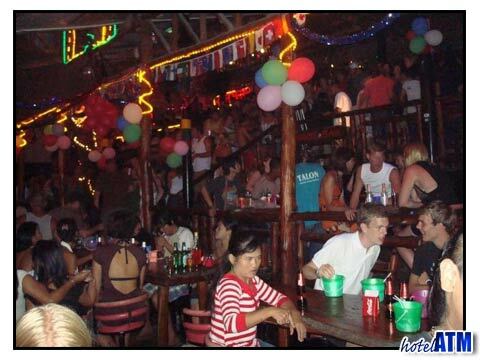 Everyone enjoys the nightlife of Carlito's in Phi Phi Island. The after hours bars are the Tiger Bar and Hippy Bar. Dance away until early morning at these two late night bars. You can always sleep on the beach during the day. What a life on Phi Phi Island! Slinky Beach Bar, down on Loh Dalum beach is where to go for a dance. This is a real happening place. The official web site of Carlito's Beach Bar and Nightclub in Phi Phi Islands, Thailand. Join the party!